Dandelion greens are from the chicory family and while delicious, can be a bit too bitter for some people. The use of tomatoes in this dish helps cut the bitterness. If you don’t have any cultivated dandelion greens (don’t use the ones growing in your yard! ), you can substitute other greens like chard or spinach. For this meal, you’ll need either an oven-proof skillet or a separate dish you can bake in. In a large skillet, saute onion, garlic, and mushrooms in the olive oil until onions are translucent. Add dandelion greens, tomatoes, thyme, and basil, continuing to saute until the greens are well wilted. Season to taste with salt and pepper. If using a separate baking dish, transfer sauteed components to that dish. 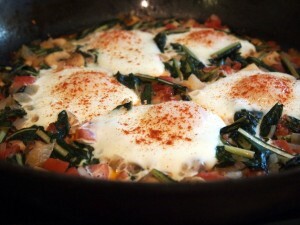 Make small wells in the the sauteed vegetables and crack an egg into each one. Bake in preheated oven for 8-10 minutes, until egg whites have set. Sprinkle tops of eggs with paprika and serve!